These tumors often cause respiratory distress in elderly patients. The finding of combined endoluminal and extrinsic disease mandates emergent treatment. Thyroid tumors are frequently hemorrhagic. Careful photocoagulation with the laser should always precede resection. In general, stent placement is necessary. 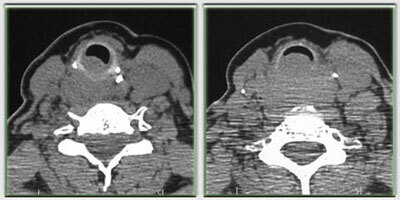 Radiographic evidence, in particular that provided by CT scan, is essential to the treatment plan. In the case shown here, malignant goiter involves the trachea. In this case, simple resection was sufficient.